How was the trend born? We owe this trend to psychic Anthony Williams and his best-selling book The Medical Medium, which argues that drinking 16 ounces of fresh celery juice each morning “can transform your health and digestion in as little as one week.” He claims it can help with everything from ADHD to UTIs! 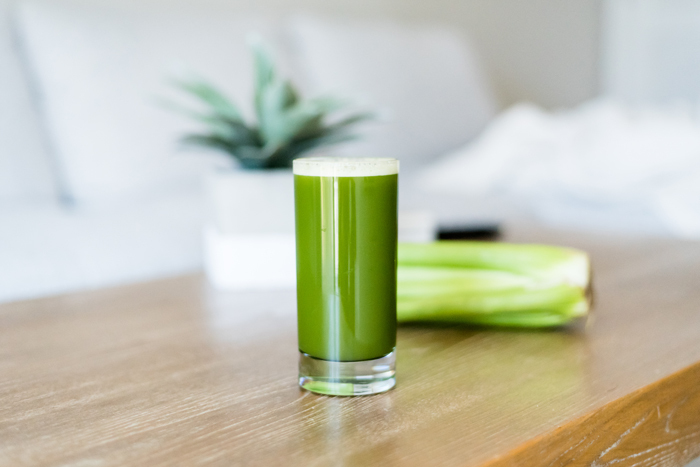 “Celery juice’s claim to recent fame is that it is said to be an amazing way to drink a wealth of vitamins and nutrients,” says Karina Heinrich, a certified integrative nutritionist and health coach. According to Jessica Rosen, a certified holistic health coach and co-founder of Raw Generation, celery juice contains important vitamins and minerals including magnesium, potassium, vitamin K, and vitamin C. “It’s excellent for bone and heart health, the immune system, eliminating toxicity from the body, and it possesses anti-cancer properties,” says Rosen. “The drink is especially powerful in its ability to reduce inflammation and improve gut health, which can help heal a number of ailments including chronic pain, skin problems, and digestive issues,” Rosen adds. If you’re convinced that The Medical Medium is on to something, a daily glass of celery juice won’t hurt you. The only thing to keep in mind is that while there are benefits to drinking celery juice, there are even more advantages to eating celery. “It’s important to remember that celery juice doesn’t contain the beneficial fiber you find in raw, un-juiced celery,” says Heinrich. “Many doctors and nutritionists warn people about juicing, saying they are missing out on the cholesterol-lowering benefits by just extracting the juice,” DeMaree adds. Want to stay on top of the latest food trends? Check out 10 food trends you’re about to see everywhere. Clearly you do not follow the millions of post from people who have been cured from years of debilitating illnesses. Before you cast judgement on holistic remedies do your homework.